Both the original and improved SOUTHAMPTON class ships entered the fleet during the 1930s; the ships of the GLOUCESTER and EDINBURGH classes were improvements on the original design. With the exception of war losses, members of all three classes saw service in the post-war period. Due to their age, the original SOUTHAMPTON class saw only minor modifications after the war; GLASGOW in fact did not see many at all. 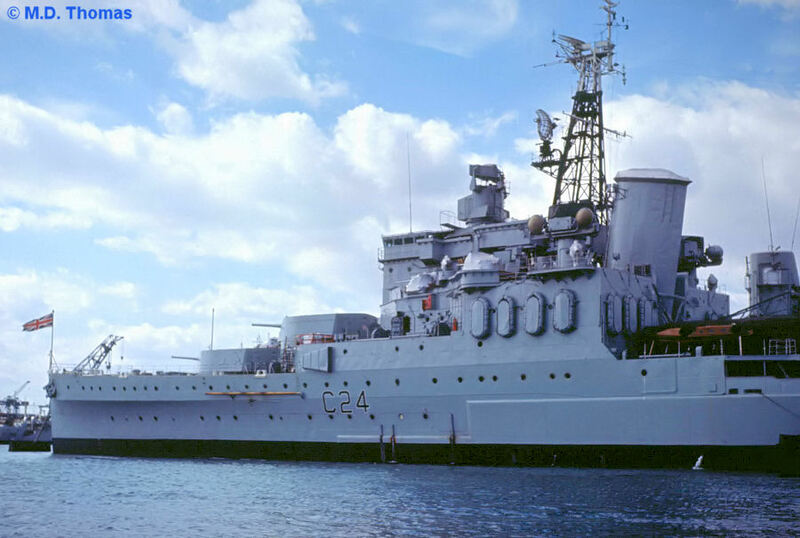 The GLOUCESTER class was a slightly heavier sibling to the SOUTHAMPTON class. We are not including the GLOUCESTER class here, for lack of photos. 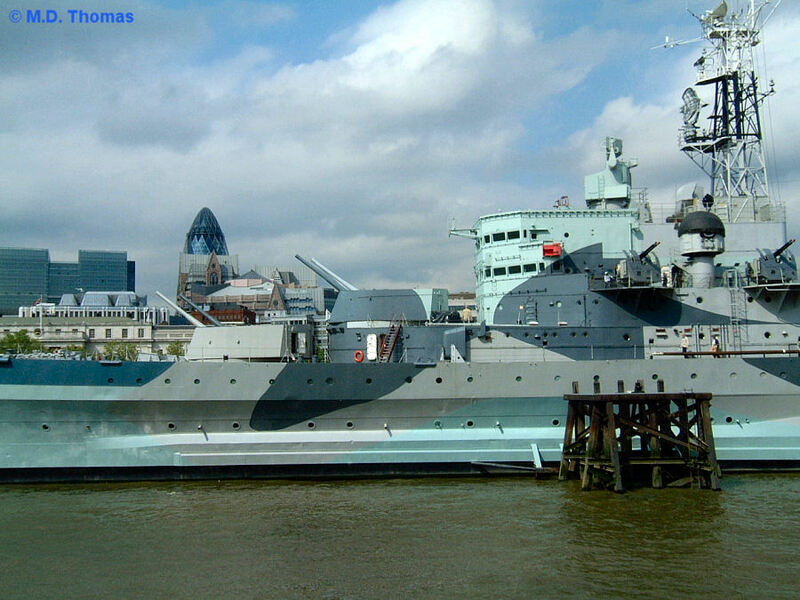 The EDINBURGH class (or Improved SOUTHAMPTON) was built slightly larger, and with better protection. 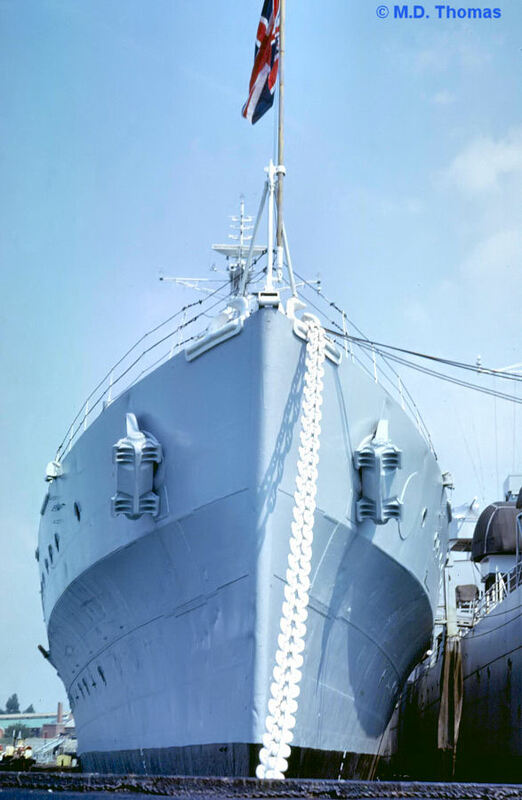 While only a year younger than the non-improved ships (which were considered too old at this time), only BELFAST was slated to receive a major modernization in 1955-56, although this was not carried out. 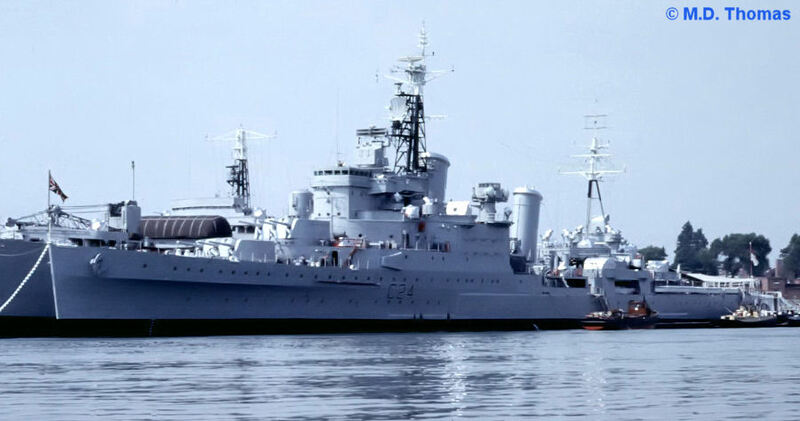 Instead, somewhat scaled-back upgrades were performed during 1956-59 which saw a new bridge added as well as some new AA armament and fire control. 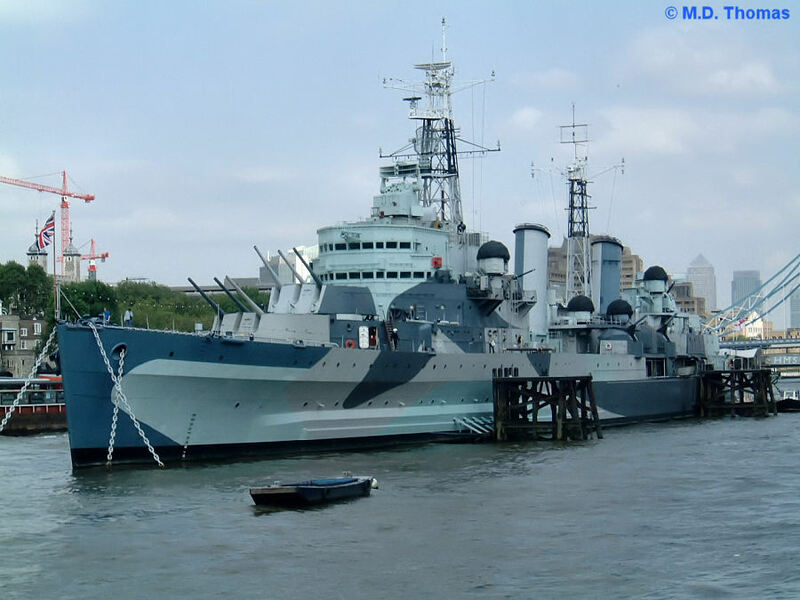 The last of the SOUTHAMPTON class, SHEFFIELD, was scrapped in 1967; BELFAST was preserved in 1971 as a museum in London on the Thames. Please note that equipment fits are only intended to be accurate for the post-war period, and even then may not be correct. Various sources disagree on class configurations. In addition, radar fits are from the review of photos, and may not be correct. Question marks indicate information not taken from published sources, or unknowns. The author would appreciate better information on this subject, if anyone has it. Originally fitted to carry two seaplanes.
? 2 - 6" DCT with Type 284 ? Refitted, 1956-59. Paid off, 1971. Note: SOUTHAMPTON and EDINBURGH were presumably sunk before they could be issued with Pendant numbers. The first four photos are of SHEFFIELD, a member of the original SOUTHAMPTON class. SHEFFIELD laid up sometime between 1963-1967. All her equipment still seems to be in place, although a number of guns, sensors, and the funnels are covered. During this period, she was serving as a harbour accomodation ship, which is reflected in her good appearance. M.D. Thomas photo. A bow-on view of SHEFFIELD. M.D. Thomas photo. Port bow view of SHEFFIELD. 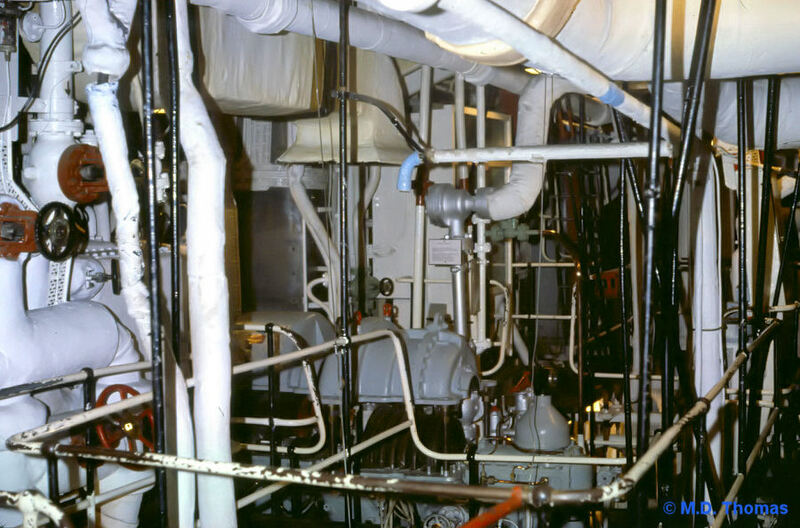 Note the main battery fire control system (6" DCT with Type 284?) 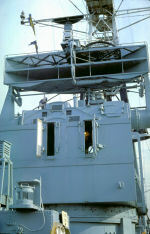 atop the bridge, with a secondary fire control system (Mk.6 HA?) on the port superstructure adjacent to the forward funnel. A twin 40mm mount is forward of this, and possibly a smaller mount (20mm?) ahead of that. 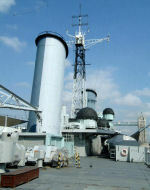 Height finder and surface search radar antennas can be seen on the mast above. 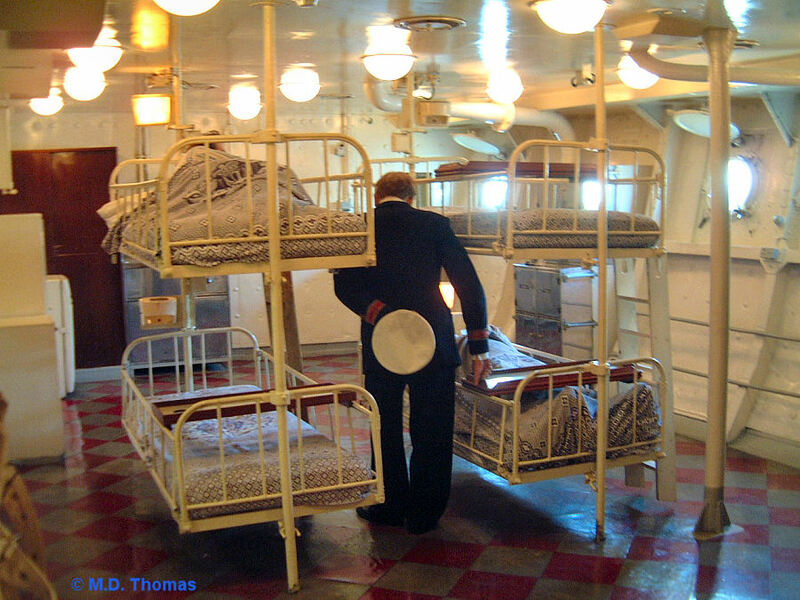 Also note the life rafts fixed to the side and aft end of the superstructure. M.D. Thomas photo. Port midships view of SHEFFIELD. 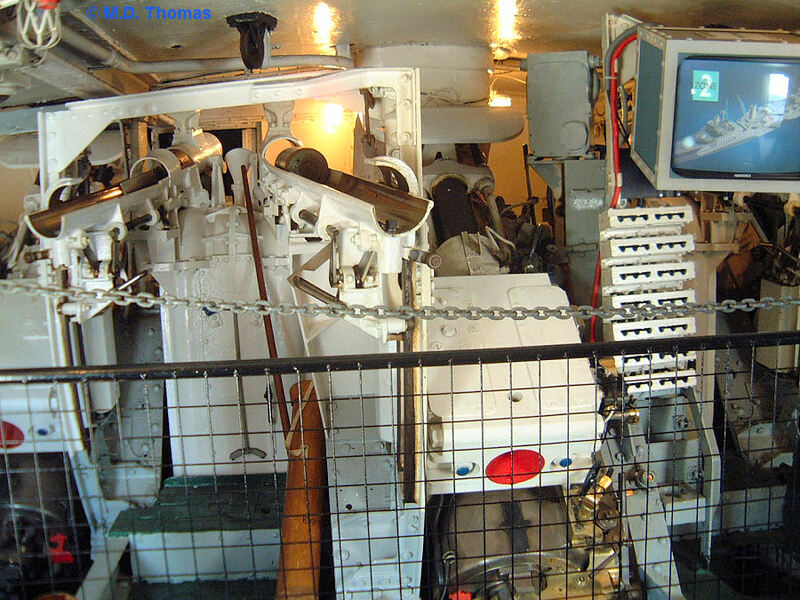 Note the forward port twin 4" gun to the right of the photo, as well as what is possibly another 40mm twin mount above and to the right of that. A crane derrick is visible between the two masts; this is where seaplanes would originally have been carried. The life rafts visible in the previous photo have now been removed, indicating this photo was taken later. The funnel behind SHEFFIELD belongs to the stores ship RAME HEAD. M.D. Thomas photo. 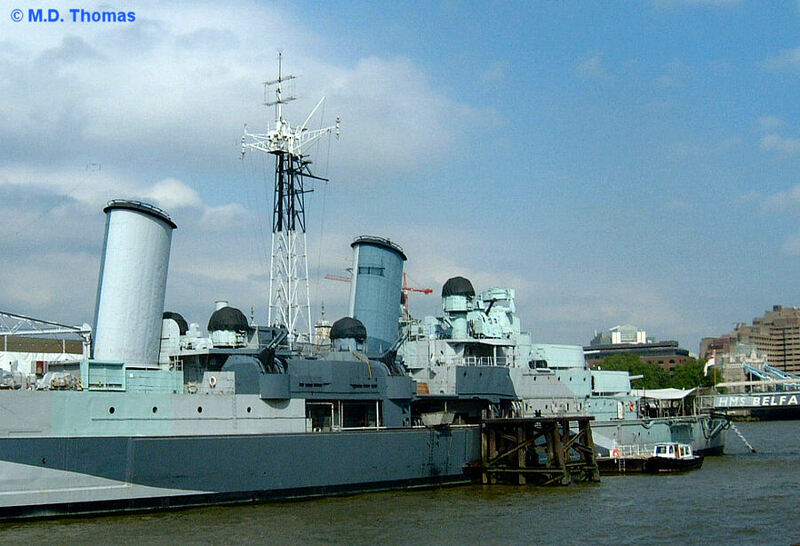 The remaining photos are of BELFAST, an EDINBURGH class ship. The first batch were taken recently, and show her as she appears today. Some older shots follow, to show how restoration efforts have progressed. 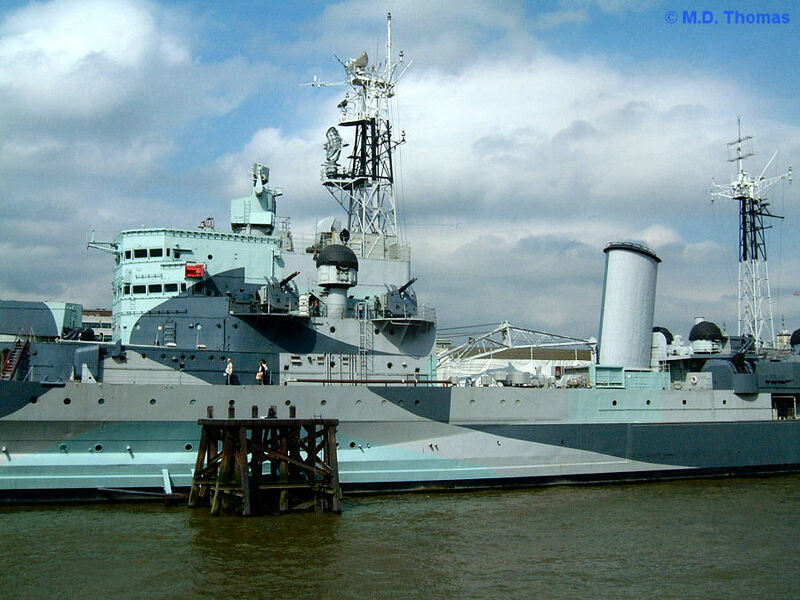 Port bow view of BELFAST, as she appears today on the Thames in London. 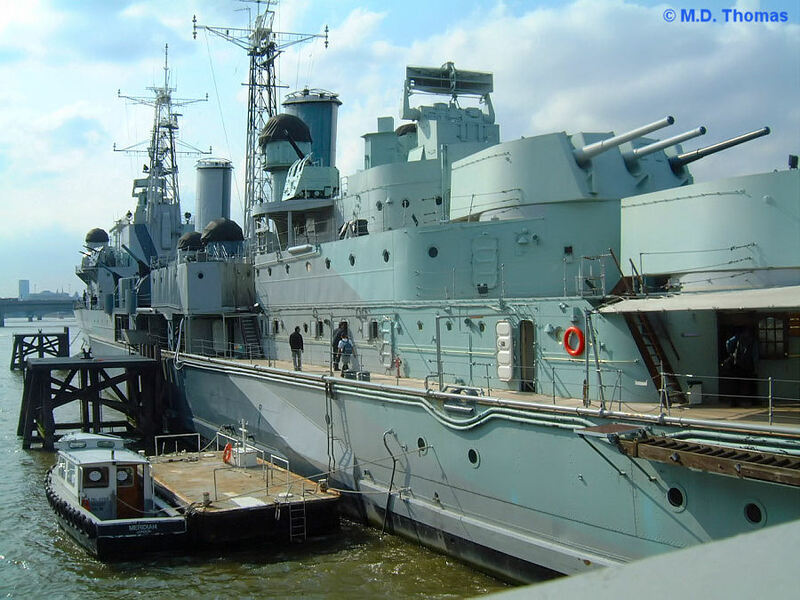 BELFAST went through a maintenance period in 1999, which saw her painted in the camoflage patterns seen here (as she appeared at the Battle of North Cape, December 1943), and some additional equipment was replaced which had been removed before she became a museum. A and B turrets are elevated to maximum, and are ranged upon a motorway service station. M.D. Thomas photo. Port side looking forward. 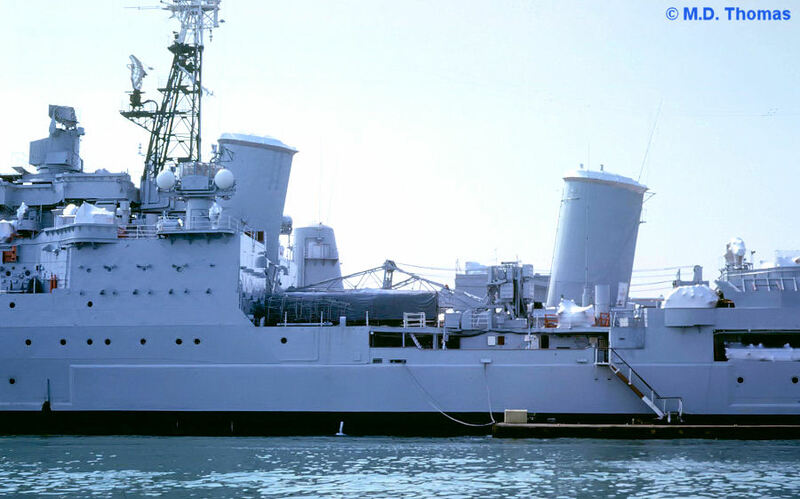 Note the aft main battery fire control system (6" DCT with Type 284?) 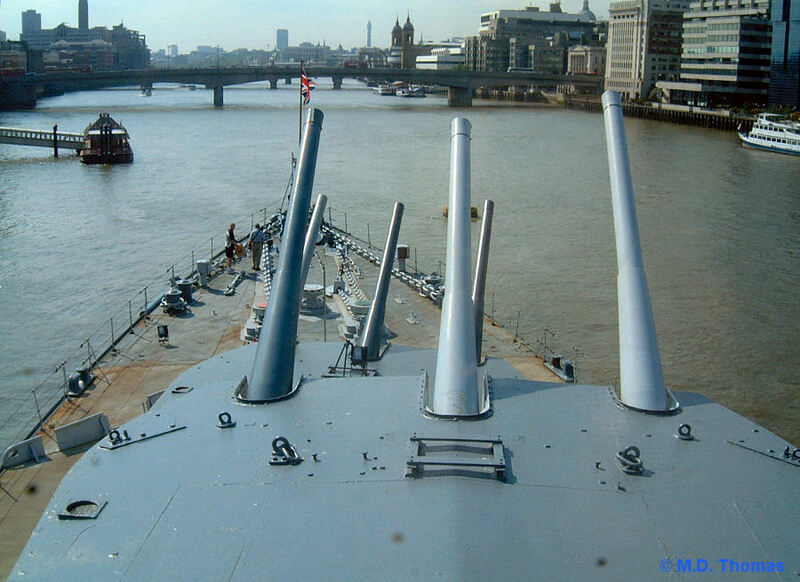 situated above the X gun mount (A and B are the two forward 6" triple mounts, X and Y the two aft 6" triple mounts, in order from bow to stern). 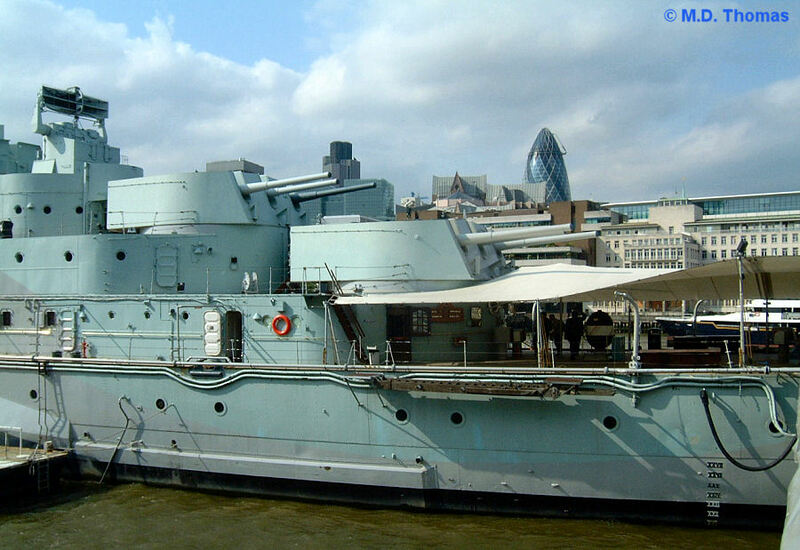 Although various members of the SOUTHAMPTON class had their X mount removed, BELFAST retained all her main battery, and the aft mounts were actually situated one deck higher than in the SOUTHAMPTON class. Immediately in front of the funnel, there is a secondary (AA) battery fire control unit (MRS8?) along with a twin 40mm gun mount. The covers on the fire control units make it hard to properly identify them. M.D. Thomas photo. 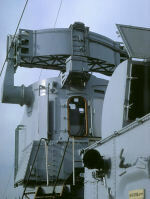 A twin 4" mount on the port side. M.D. Thomas photo. The formard main battery and superstructure. M.D. Thomas photo. 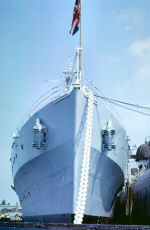 After 1959, 6 sets of 40mm twin mounts were added to the forward (4 sets) and rear (2 sets) superstructure, but the two aft sets on the forward superstructure were removed in 1963. 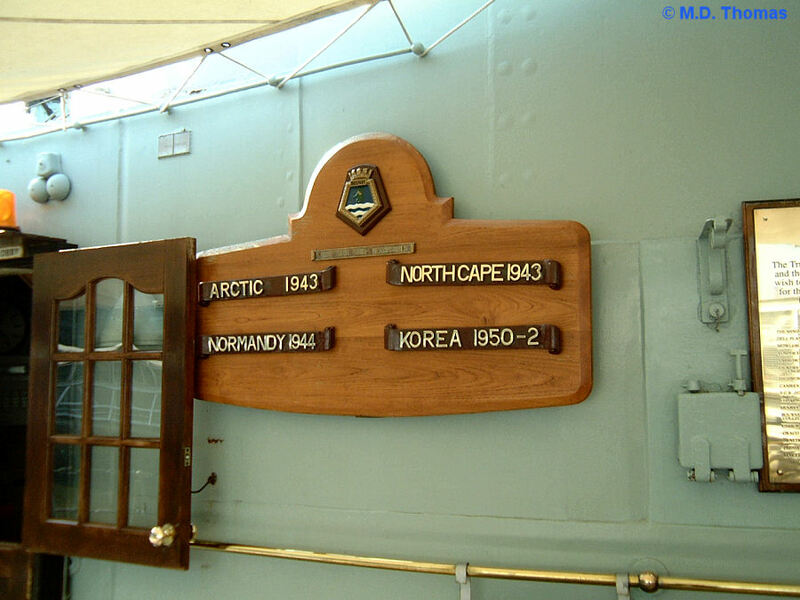 These mounts seem to have been replaced during the 1999 refit, and are visible here. Aft of the second 40mm mount is one of the forward port MRS8? fire control units. 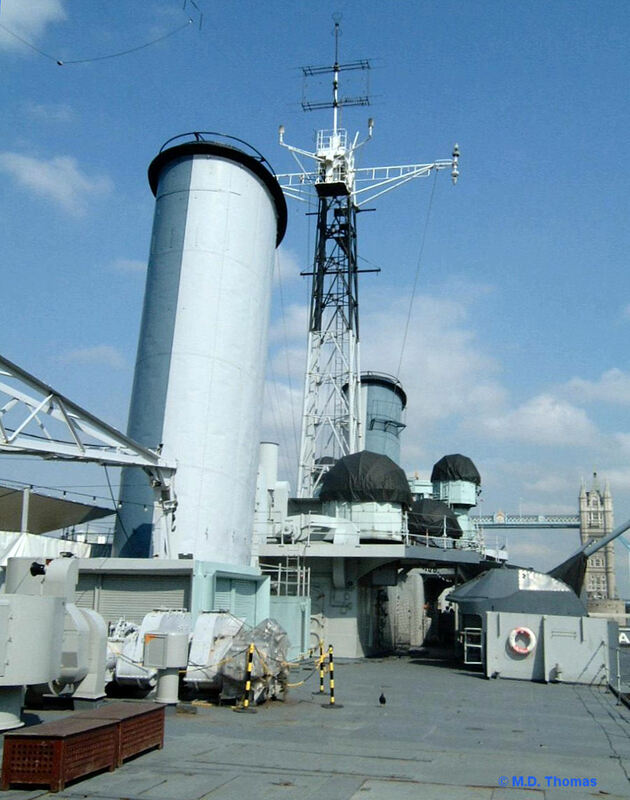 The main battery fire control and radar antenna on the mast above seem to be identical to those fitted on SHEFFIELD, as noted above. 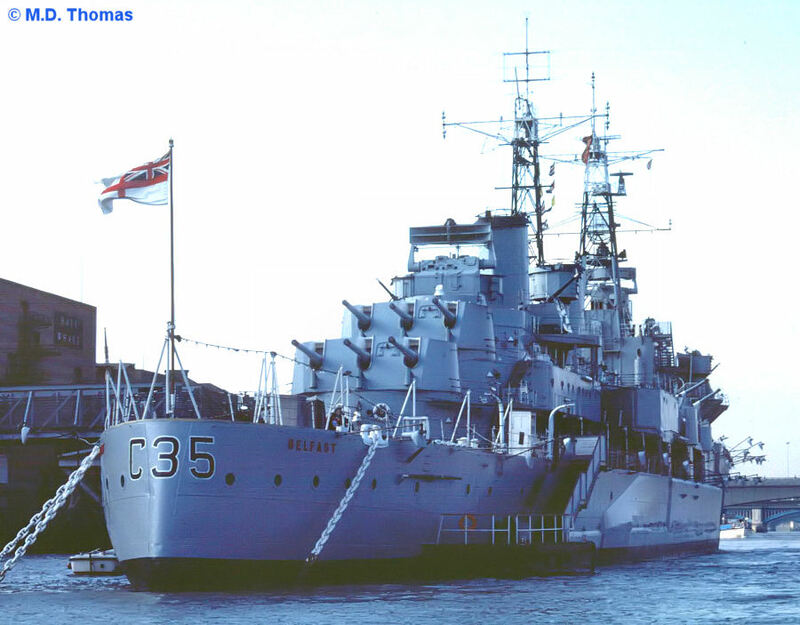 Note that BELFAST's two funnels are located further aft than those on SHEFFIELD, and the crane derrick is actually located forward of (instead of aft of) the forward funnel. Again, this would have been where the seaplanes were originally carried, and where launches and other boats were kept after the seaplanes were removed. The M.D. Thomas photo. Looking aft along the port side. Atop the aft mast is what appears to be a Type 279 air warning radar antenna, although this set was supposed to have been obsolete long before BELFAST paid off. M.D. Thomas photo. The aft main battery. M.D. Thomas photo. Port side, looking aft. M.D. Thomas photo. Looking forward from the bridge over the forward triple 6" gun mounts. M.D. Thomas photo. 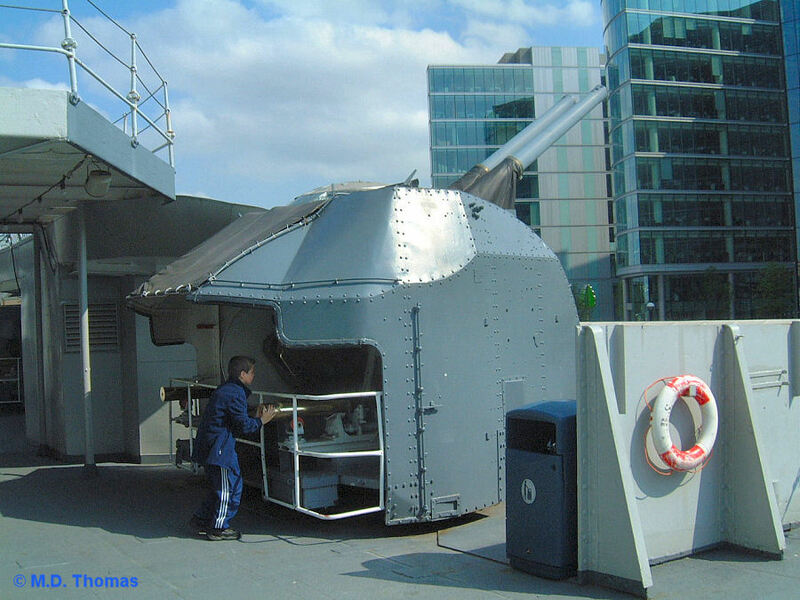 A Bofors Mk.5 twin 40mm mount, with a covered MRS8? fire control unit in the background. M.D. Thomas photo. This photo shows the centre breach of A turret. M.D. Thomas photo. A Surgeon Lt. Commander on his medical rounds in the ship's sick bay. M.D. Thomas photo. 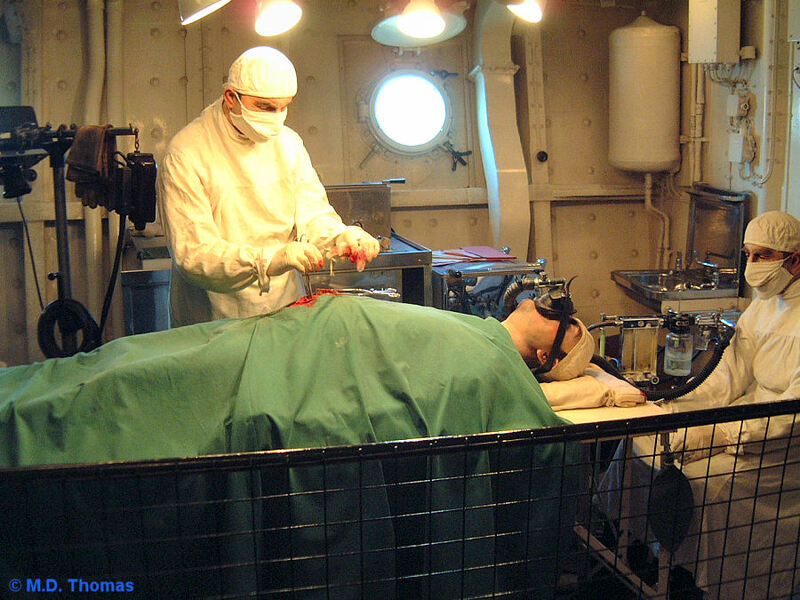 An operation mock-up in the ship's operating room. Contrast this with the original mock-up, which is pictured below. M.D. Thomas photo. BELFAST's Battle Honours. M.D. Thomas photo. 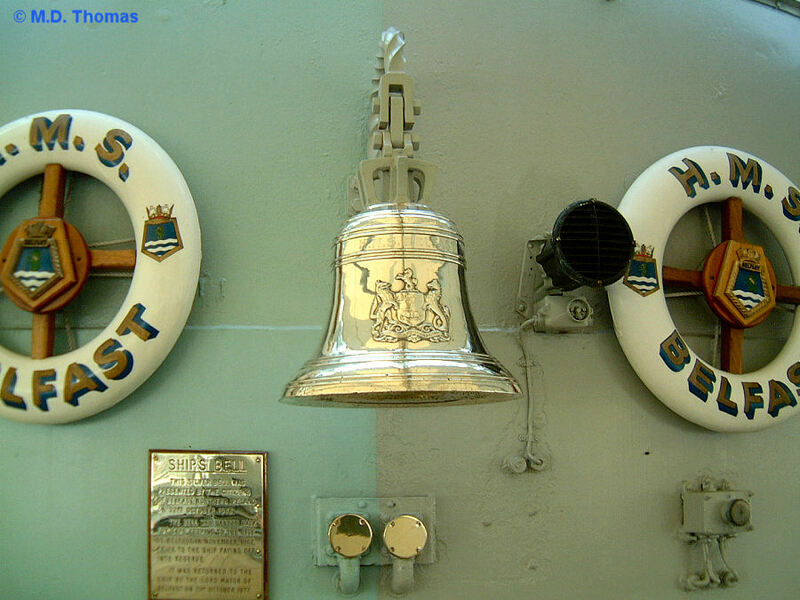 The ship's bell. M.D. Thomas photo. An older view of BELFAST, taken off the starboard stern. 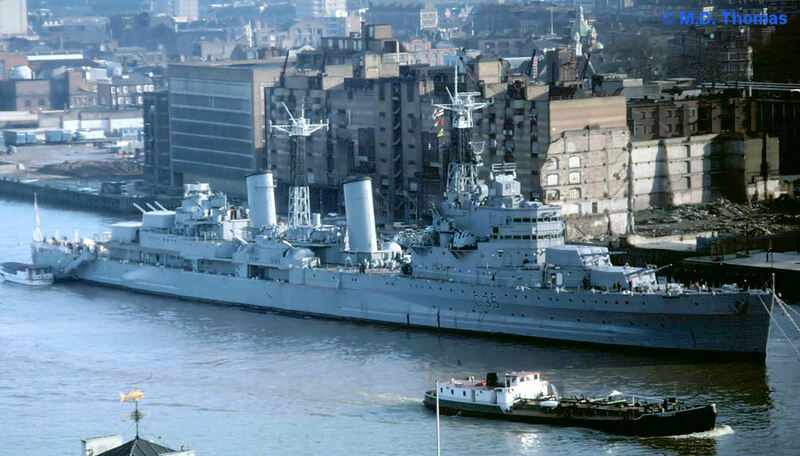 This photo was taken within a year or so of BELFAST being moored in the Pool of London. M.D. Thomas photo. An aerial view of BELFAST, taken from the Fire of London monument. Note the missing 40mm twin mount from the aft position on the forward superstructure. M.D. Thomas photo. 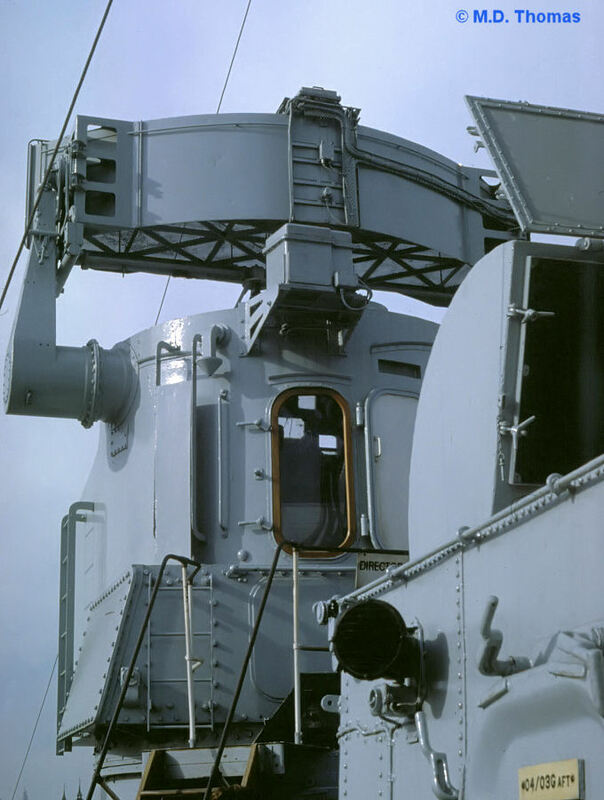 A close up of the forward main battery fire control tower (which is assumed to be a 6" DCT with Type 284), with a radar antenna possibly belonging to the Type 974 DECCA navigation radar set. M.D. Thomas photo. 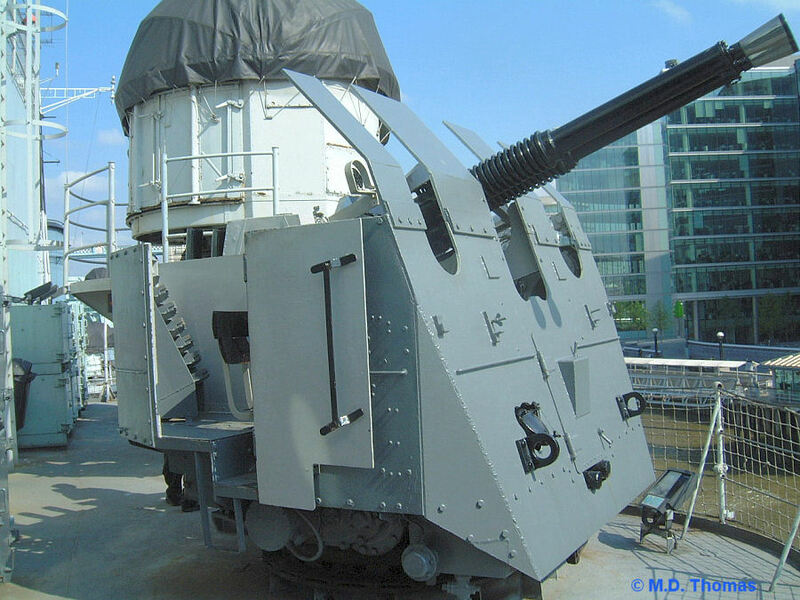 The aft end of the 6" DCT with Type 284 fire control tower. M.D. Thomas photo. 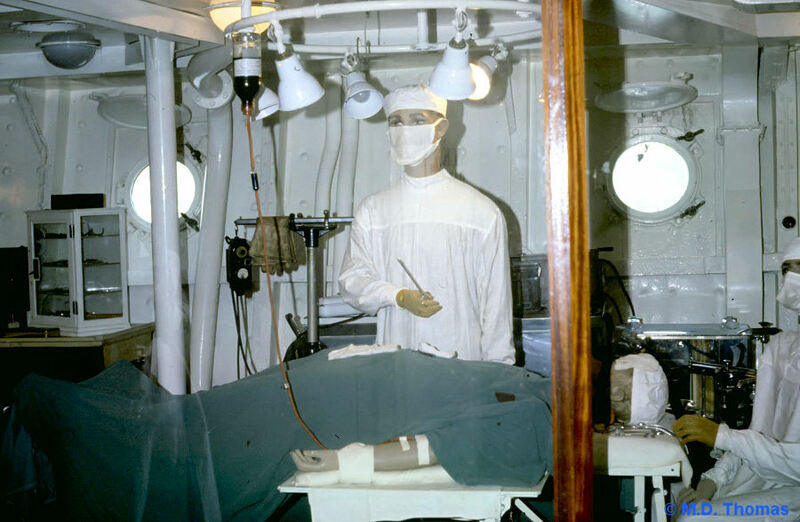 The original mock-up of the operating room. M.D. Thomas photo. This shot was taken within one of the inboard engine rooms, with what appears to be a partially dismantled steam turbine in the background. M.D. Thomas photo. Copyright © 2004, Sandy McClearn. All Rights Reserved.